It gives me immense pleasure to invite you and your family to our special 2017 Samuh Bhajan in memory of our loved ones. 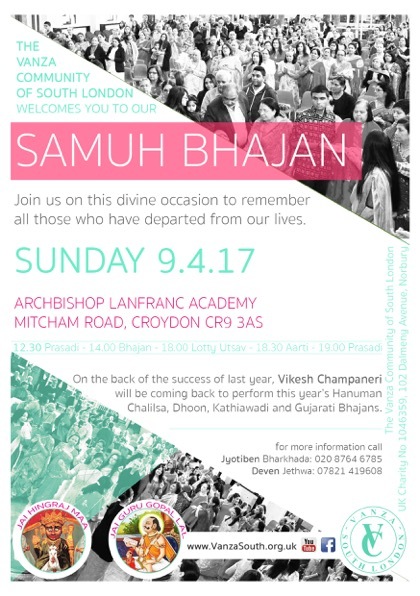 With the blessings from Hingraj Mataji, Vanza Community of South London invites you to our annual Samuh Bhajan to be held on Sunday 9th April 2017 at The Archbishop Lanfranc Academy at 12.30pm. Due to popular demand, we are proud to welcome back Vikesh Champaneri and his bhajan mandli to stage the occasion. The purpose of the Samuh Bhajan is to respect and remember those we have lost and to celebrate their lives. Let us join together as a community through singing Bhajans and performing a Samuh Aarti to celebrate all that our loved ones have achieved. The success of the programme has been possible due to your generous sponsorship and the dedication of the Committee members and the Trustees. With the blessings from Hingraj Mataji and Guru Gopalal and your support, our Samuh Bhajan has been a triumph. Please continue to donate generously by completing the sponsorship and membership form which can be found using the link at the top of the site. Thank you for your continuous support and look forward to seeing you all.